Transportation Daily inter-island flights from Honolulu to Kapalua-West Airport, less than 1 mile away. Kahului airport is 45 minutes away. Rental cars are available through our rental manager at excellent rates. 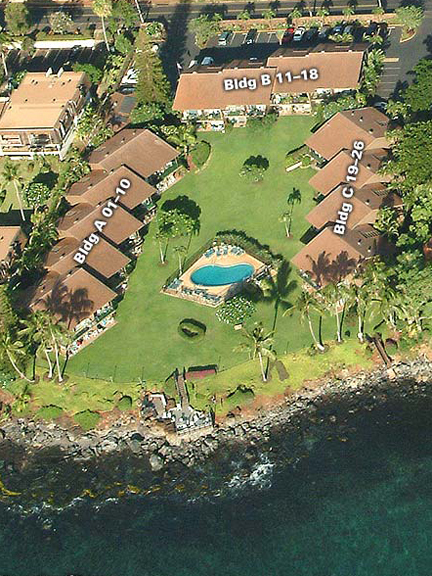 Nearby golf at Kapalua and Kaanapali, surfing windsurfing, snorkeling, whale watching and other water activities. Shopping and Restaurants: Kapalua, Kaanapali and Lahaina are only minutes away and offer many fine shops and restaurants. Spacious one, two and three bedroom condominiums, each with its own private lanai. All units are ocean front and ocean view. Scenic redwood deck at the edge of the shore where you can relax and barbecue. The condominiums feature color cable TV, VCR, telephone and a fully equipped kitchen with dishwasher, refrigerator, microwave, range, coffeemaker and more. Washer/dryer on the premises; all the units have ceiling fans. Our spacious Tropical grounds and beautiful heated swimming pool will delight you.